URBANA, Ill. – When deciding which sweet corn hybrids to plant, vegetable processors need to consider whether they want their contract growers using a workhorse or a racehorse. Is it better to choose a hybrid with exceptional yields under ideal growing conditions (i.e., the racehorse) or one that performs consistently well across ideal and less-than-ideal conditions (i.e., the workhorse)? New research from the University of Illinois suggests the workhorse is the winner in processing sweet corn. “Experts say the ideal cultivar would have exceptional yield regardless of the weather, and across a large area, but it’s unknown if such cultivars are commercially available,” says Marty Williams, an ecologist with the Department of Crop Sciences at U of I and USDA-ARS. Williams says a number of crops have been studied for yield stability, a cultivar’s ability to produce consistent yields across inconsistent environments. The work has resulted in several recommendations about where to grow specific cultivars for the best results. “Stability analysis is valuable, particularly given the increased weather variability we’re facing. However, previous studies always stopped with recommendations. No one appears to have quantified if such recommendations are followed. Our work is about how yield stability of individual hybrids actually relates to hybrid adoption in sweet corn,” he says. Although the focus is on sweet corn, the study is the first to link a cultivar’s yield stability with adoption in any crop. Williams obtained data from an anonymous vegetable processing company, representing more than a decade of sweet corn hybrid assessment trials across the upper Midwest and the Pacific Northwest. He pulled the number of cases produced per acre – a yield metric important to processors that he calls ”case production” – from each trial, and then incorporated environmental data to calculate yield stability for 12 of the most commonly planted hybrids grown for processing. Performance of each hybrid was related to all other hybrids across a wide range of growing conditions. This enabled Williams to assign each hybrid to categories of high, average, and low stability and high, average, and low yield. He found 10 hybrids were average for both stability and yield. A few hybrids had above-average yield or above-average stability, but none had both, suggesting the ”ideal” sweet corn hybrid does not yet exist. Williams then analyzed another dataset representing nearly 15,000 processing sweet corn fields over a period of 20 years. He was able to calculate the acreage planted in each of the 12 hybrids from the hybrid assessment trial. Those 12 hybrids accounted for most of the acreage planted to sweet corn over the 20-year period for the processor. Most hybrids accounted for 1 to 4 percent of the planted acreage. However, he found a single hybrid was planted on disproportionately more acres: 31.2 percent, to be exact. That hybrid was the only one exhibiting above-average stability across variable growing conditions. 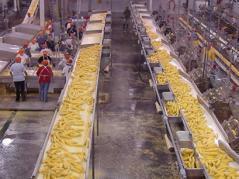 In processing sweet corn, vegetable processors – not growers – choose the hybrid for each field. Processors need hybrids that lend themselves to machine harvest, ears that hold up to processing, and kernels that maintain quality as a finished product. Williams says vegetable processors also consider the capacity of their processing facilities. Evidence that vegetable processors prioritize stability could inform future sweet corn breeding programs, and, according to Williams, it could provide a sense of security for growers. “Growers are more likely tasked with growing a workhorse over a racehorse. That decision buffers them, as well as the processor, from less-than-ideal growing conditions,” he says. The article, “Genotype adoption in processing sweet corn relates to stability in case production,” is published in HortScience.